In my last few posts, I’ve shared strategies I used to find records on my Sniffen cousins from Westchester County, New York. Today I’m using a different strategy: I’m simply searching GenealogyBank for the last name “Sniffen” with the keyword “Westchester” to see what other Sniffen cousins I can find that might not be in my notes. This search came up with several interesting Sniffen cousins. 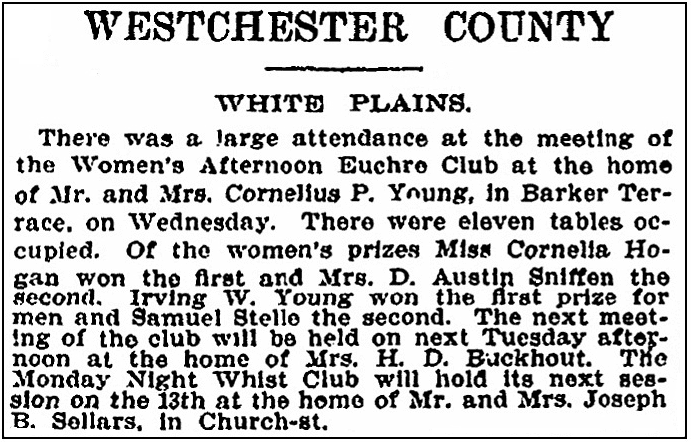 The following Westchester County news article mentions a meeting of the Women’s Afternoon Euchre Club at which Mrs. D. Austin Sniffen won second prize. After a quick FamilySearch query for “D Austin Sniffen” I found my cousin David Austin Sniffen (1873-1950) of White Plains, Westchester County, New York, and his first wife Helen (Farley) Sniffen (1867-), to which this article probably refers. This next article from the New York Tribune writes about an upcoming “sociable” at the White Plains Presbyterian Church at which many of my Sniffen cousins would participate. 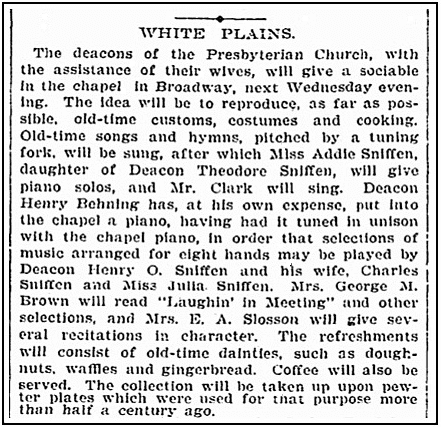 My Sniffen cousins likely referred to in this article include the young pianist Adeline B. Sniffen (1875-) and her father Deacon Theodore Sniffen (1848-1938), Deacon Henry O. Sniffen (1870-1941), Charles E. Sniffen (1854-), and Julia E. Sniffen (1882-). This is an important find. With so many of my cousins actively attending this specific church, I can focus on that church and its records to get more of the details of their lives. Next, I found an obituary mentioning my cousin Allan Mead Sniffen (1796-1873) and his wife Eliza Ann (Lawrence) Sniffen (1805-1870). A good find. I did not have her date of death – now thanks to this obituary record I can add that information to the family tree. Genealogy Tip: Search using one of your family surnames and the name of the town or county where they lived to discover cousins you may not already know about. By bringing together every possible cousin, you can extend and map out the family tree – lining up the information until you can confirm or exclude each one from your family tree. 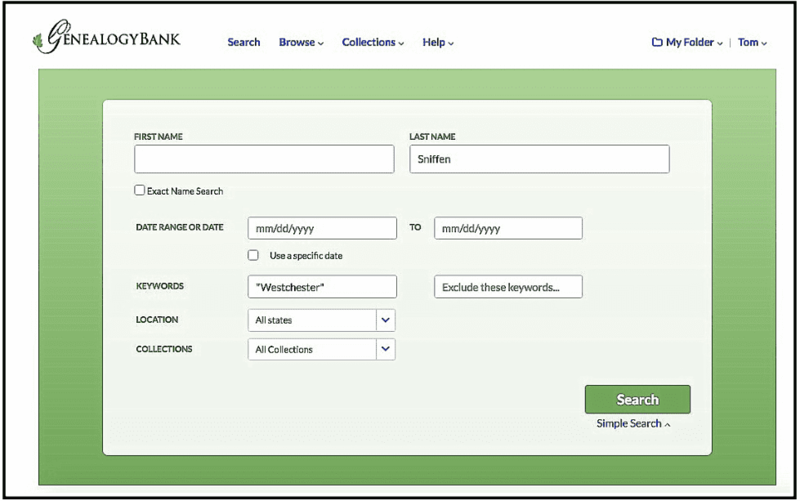 February Update: GenealogyBank Just Added New Content from 103 Titles! Great tip. Glad to see you are still doing well. A John “Tys” Sniffen is a good friend of one of our sons. Lives in California, born in Wisconsin. May be your relative. Sounds like a cousin, Marcy. This may possibly be the death date of your Adeline B. Sniffen. This looks like it could be her. Many thanks for taking the time to look this up and send it to us. I enjoy the tips you give. Well, Lorie, thank you so much for taking the time to write.